In 1946’s Notorious, Alfred Hitchcock reunites with two of his most successful collaborators, Ingrid Bergman and Cary Grant, both of whom worked together for the first time on this thriller. John Huberman (Fred Nurney) gets convicted of treason as a German spy, and rather than sit through 20 years of prison, he kills himself. During and after the trial, his daughter Alicia (Bergman) opts for boozing and risky behaviors to distract herself from her personal woes. At a party, she meets and seduces the mysterious TR Devlin (Grant), a man who turns out to be a government agent. Devlin recruits Alicia to fly to Brazil and ingratiate herself with her dad’s former cronies so she can report their plans. While she and Devlin fall for each other, she must pretend to go for an old acquaintance – and Nazi sympathizer – Alexander Sebastian (Claude Rains). Various complications ensue. Where does Notorious land on this list? Fairly low, I’m afraid, as I think it provides semi-forgettable Hitchcock. I’m glad it loses the tedious psychobabble of Spellbound, but it fails to boast that movie’s stronger elements. While Spellbound has its flaws, at least it comes with an intriguing narrative that unravels in a compelling manner. On the other hand, Notorious starts slowly and never quite recovers. Much of the problem stems from the bland characters. While they should come across as lively, they don’t, perhaps due to miscasting. Bergman is too regal and classy for “party girl” Alicia, which means she should seem like a loose cannon to some degree, but Bergman couldn’t pull off “rebellious and rambunctious” if her life depended on it. Grant is okay as Devlin but also seems wrong for the part. Someone a little more “middle America” like Bergman’s Spellbound co-star Gregory Peck might’ve made more sense in this kind of role. Finally, the usually-reliable Rains completes the miscasting trifecta, partly due to age. Then pushing his late 50s, he simply seems too old for the character. Heck, his “mother” was only a few years older! Despite all my criticisms, Notorious isn’t a bad film, and it percolates better during its third act. I still regard it as average Hitchcock, however, as it comes with too many obstacles to turn into a true success. 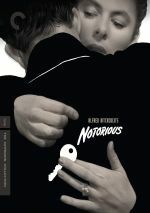 Notorious appears in an aspect ratio of approximately 1.37:1 on this Blu-Ray Disc. Though a little iffy at times, this was usually an appealing presentation. Overall sharpness seemed good, but exceptions occurred, as some shots felt a bit soft. Still, most of the movie provided nice accuracy. Blacks looked dark and deep, while shadows were smooth and clear despite the use of “day for night” photography. I wouldn’t call this one of the best-looking Hitchcock Blu-rays, but it still seemed solid. As for the film’s PCM monaural soundtrack, it worked fine given the era of its origins. Speech remained a little thin but still appeared reasonably natural, without edginess or other issues. Music showed pretty good range and punch, while effects came across as a bit lifeless but accurate and clean enough. The audio held up nicely over the last 70-plus years. 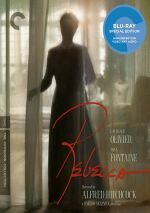 How did the 2019 Criterion Blu-ray compare to the prior Blu-ray from 2012? Audio felt a bit clearer and smoother, while visuals came across as cleaner and more precise. The Criterion release clearly offered an upgrade over the mediocre 2012 release. As we shift to supplements, we find two audio commentaries, and the first features Hitchcock scholar Marian Keane. Taped in 2001, she presents a running, screen-specific look at story, characters, themes, cinematic techniques and interpretation. Keane rarely touches on actual production topics, so she sticks with a more introspective view of the film, heavy on the aforementioned interpretation. If she provided the only commentary on the disc, this would bother me, but since the second track tells us about the shoot itself, I’m fine with Keane’s perspective. She gives us an informative, insightful examination of these deeper interpretative domains and makes this a worthwhile chat. For the second commentary, we hear from film historian Rudy Behlmer. Recorded in 1990, he provides his own running, screen-specific take on the film’s path to the screen, cast and crew, and various production-related areas. In other words, Behlmer brings all the information I would’ve otherwise have missed from Keane’s commentary. I’ve long been a fan of Behlmer’s chats, as he always offers brisk, informative historical discussions. This one lives up to expectations and becomes a fine examination of the movie’s creation. Next we get a 1948 Lux Radio Theatre version of Notorious. It runs 59 minutes, 56 seconds and brings Ingrid Bergman back to play Alicia, whereas Joseph Cotten takes on the Devlin role. This one gives the tale a totally different opening – we meet Devlin before we encounter Alicia – and plays in a more narrative-oriented manner. It’s reasonably interesting, and I actually think Cotten fits the Devlin part better than Grant did. From 2009, a documentary called Once Upon a Time… Notorious goes for 52 minutes, two seconds and includes a mix of then-new and archival comments from filmmakers Alfred Hitchcock, Stephen Frears, Peter Bogdanovich, and Claude Chabrol, actor Ingrid Bergman, Bergman’s daughter Isabella Rosselini, film critic David Thomson, Hitchcock’s granddaughter Mary Stone, and film historians Sidney Gottlieb, Charlotte Chandler and Bill Krohn. “Time” examines aspects of Hitchcock’s career and the historical factors that impacted Notorious, story/character elements and the movie’s path to the screen, cast and crew, various production components, and the film’s release/legacy. Inevitably, “Time” repeats some information from the prior commentaries, especially Behlmer’s. Nonetheless, it offers a very nice summary of details connected to the film and its production, so it becomes a worthwhile program to view. A program called Powerful Patterns lasts 29 minutes, 42 seconds and provides an interview with film scholar David Bordwell. He analyzes the climax of Notorious and views its connections to other Hitchcock films. Actually, that sells “Patterns” short, as it offers a broader overview than this synopsis implies. Bordwell brings us an informative deconstruction of various film elements. With the 23-minute, 25-second Glamour and Tension, cinematographer John Bailey gives us a look at the movie’s visual choices. Bailey’s discussion gives us a useful perspective on these topics. Poisoned Romance fills 21 minutes, one second with comments from biographer Donald Spoto. He offers a general overview of the film and its creation. Like some of the other pieces, parts of Spoto’s chat become redundant, but he brings enough unique information to turn this into another effective program. “Writing” emphasizes visual techniques, with an emphasis on Hitchcock’s use of storyboards/planning. A good array of insights arise here. Lastly, Pathe Reporter Meets… brings a 1948 newsreel in which Hitchcock chats with Bergman. It lasts a mere 48 seconds but offers a fun archival bit. In addition to four trailers, we find a Booklet. It mixes credits, photos and an essay from critic Anjelica Jade Bastien. The booklet concludes the package on a positive note. Many seem to regard Notorious as one of Hitchcock’s all-time great films, but I must admit I don’t get its appeal. While it has its moments, I think it’s too slow and lacks enough intrigue to qualify as better than average. The Blu-ray provides good picture and audio along with a strong package of bonus materials. Maybe someday I’ll warm up to Notorious and join its legions of fans, but today, it largely leaves me cold. This Criterion release becomes its best representation, though.